So I thought I would give it a whirl (the old college try! ), let’s all get together and take 10 SECONDS and Vote for MENC to be one of ten to receive $25,000 in the Chase Community Charity Event. What does it take for you to click the following link and support Music Education… I already told you –> About 10 seconds of your life! What can MENC do with this money? A heck of a lot more than they can do without it! It’s no secret, music and arts are facing some serious problems in the schools and this is something simple that you can do to help — every little bit of money and effort helps! 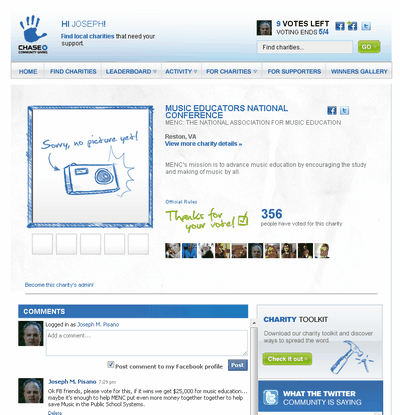 Just by voting on this (and hopefully asking all of your FB friends and Tweeps to follow suit) only builds more awareness about Music Education. Please take the 10 seconds and do this NOT! Why not?